LONDON, England -- A U.S. Marine Corps dog that sniffed out explosives and protected thousands of troops has been honored with a prize for animals serving bravely in military conflict. 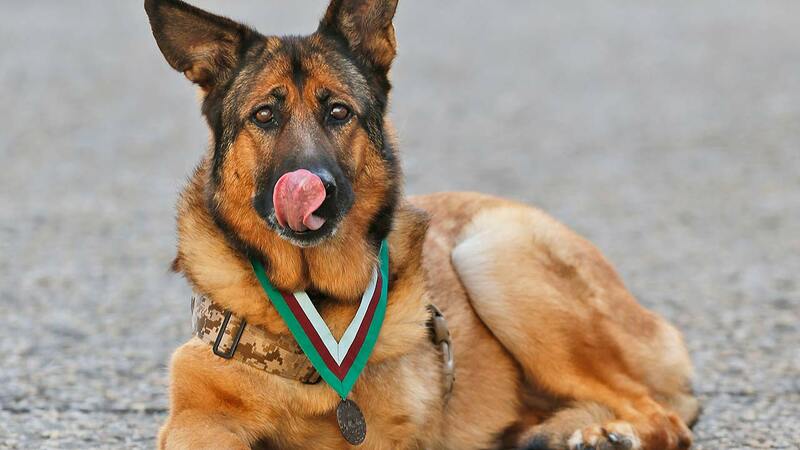 Lucca, a 12-year-old German Shepherd, won the Dickin Medal, the animal equivalent of the Victoria Cross, a decoration for bravery. She is the first U.S. Marine Corps dog to receive the honor. Lucca is credited with saving thousands of allied troops and never had a human casualty on one of her patrols. On her final patrol in Afghanistan, she discovered a 30-pound (13.6-kilogram) improvised explosive device and was searching for more when a second device detonated. Lucca lost her left leg, but survived. Her owner, Gunnery Sergeant Christopher Willingham of Tuscaloosa, Alabama, was by her side Tuesday in London as she received the medal.